The good news is that Tucson has an extensive network of bike lanes. They go everywhere, are well marked, and respected by cars. The not so good news is that there is a lot of traffic. Even out in on the fringes of town, in the Catalina Foothills, the roads are heavily traveled and cars whiz by constantly. Hailing from Duluth, I am just not used to that level of population. Enter The Loop. The 55 mile loop that circles the city has just been completed, but it’s much more than that. It is a network with 131 miles of wide, paved, shared use trails that run across vast portions of the city. Most legs run along “washes” – dry river beds that fill with runoff during the rainy season. In fact, The Loop grew out of the 1983 flood disaster. 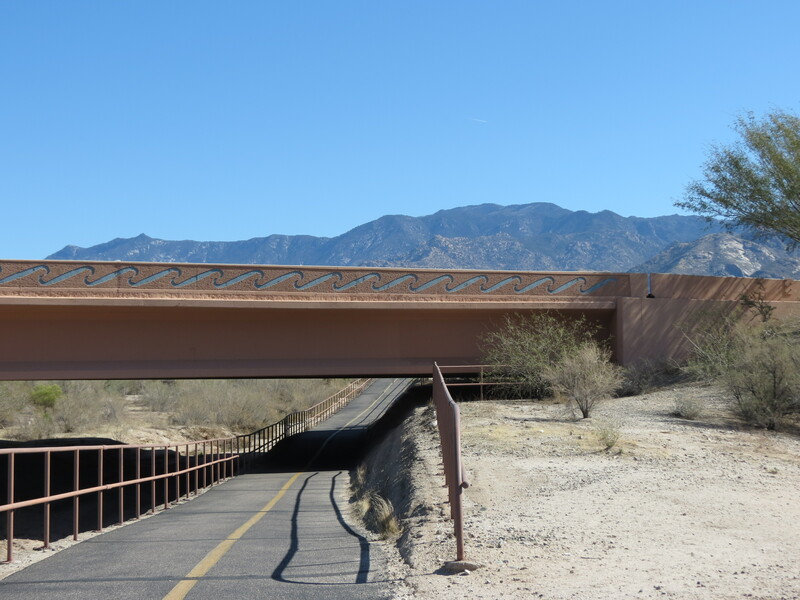 Realizing the need to reinforce the banks of the major washes, the county took the opportunity to create river parks and trails atop the new soil-cement banks. 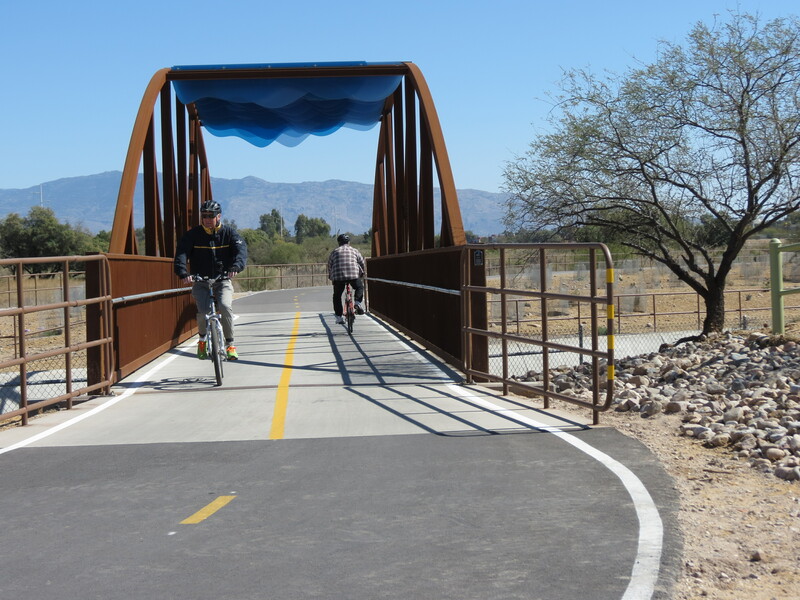 It has become one of Pima County’s most popular recreational features. It’s not often that bicycle trails are truly vehicle-free. But great pains have been taken to shelter The Loop. The trail dips under streets and bridges cross over side washes. Many stretches are landscaped with gardens or simply feature desert environs. Railings carefully guard users from the steep banks that dip into the wash. The nearest entry point to The Loop is 4.5 miles from our condo. It is worth navigating that stretch of bike lanes to reach carefree cycling. So far, I have covered only about 50 miles of The Loop, but have returned to some sections multiple times. Coordinating a ride with Rich one day allowed me to venture further afield, from our place all the way out to Catalina State Park – a good 30 mile stretch. The Loop is open to any non-motorized use, and just in the last two days I have seen all types of transport gracefully coexist on its paths. There were plenty of cyclists, runners and walkers of course. I also passed strollers, scooters, recumbent tricycles and dog walkers. The most unusual was a woman on a standing elliptical bike, doing her first 50-mile ride! It is cycling at its easiest – level with good pavement and well signed. Despite the appeal of The Loop, sometimes challenge beckons. Then I return to Sabino Canyon to climb into its depths during cycling hours. Or I find my way onto smaller local roads. Inevitably they rise and fall. We are in the foothills after all. It was well worth the long drive to bring our bikes on this trip. 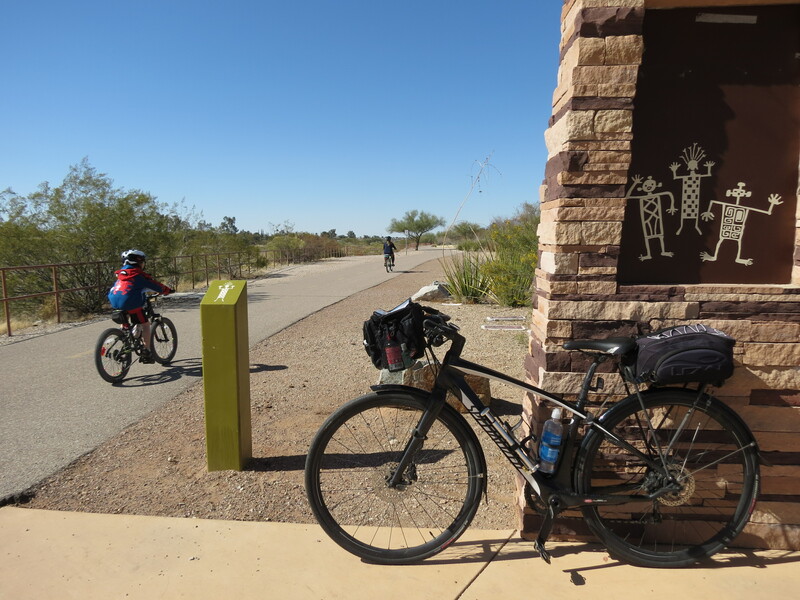 I’ve spent many hours in the saddle this week, exploring Tuscon on two wheels. This entry was posted in Keeping Fit, Outdoors, Travel and tagged Cycling, Travel by Molly. Bookmark the permalink.